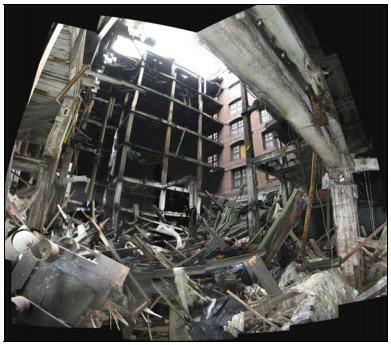 A composite image from an engineering report by ABS Consulting shows the partial collapse of the timber supports for the east wall of Cupples 7. The city's preservation board denied a demolition permit for the building on Monday. The city's Preservation Board voted nearly unanimously Monday night to deny a demolition permit to the owner of a crumbling warehouse in the Cupples Station historic district near Busch Stadium. McGowan Walsh, the building's owner, applied earlier this month for the permit, citing the building's deteriorating condition and the economic infeasibility of securing millions of dollars to simply stabilize the building for future redevelopment. The city's Cultural Resources Office denied the application on November 15th - McGowan Walsh appealed. "We would love to have seen this building saved as well, but conditions have prevented that from happening," McGowan-Walsh attorney Jerry Altman told the board on Monday. "That's why I'm reluctantly but respectfully asking you to allow the demolition." His request fell on deaf ears - the board voted 5-0, with one abstention, to deny the permit. "I think those building summarize the history and heyday of St. Louis at the turn of the century almost as much or even more than the World's Fair," said Cultural Resources Office director Betsy Bradley, who did the initial evaluation. "They show the fine architecture that we had, the wealth that we had in commerce and transportation, and the innovate leaders that we had to even think of the concept of a Cupples Station." In his testimony, Altman said the cost to rebuild the interior grid of timbers that support the walls of Cupples 7 would cost $8 million to $10 million, whereas demolition would cost about $675,000. "For the building to be renovated or to be salvaged, either the city has got to step up and purchase it or a private owner or developer has got to purchase the building," Altman said, adding that another developer had been interested in buying Cupples 7 but could not get the numbers to work. Bradley said the Preservation Board and her office were not asking McGowan Walsh to completely rebuild the structure right now. "Focus on stabilizing the brick walls," she said. "This is an opportunity for unusual type of redevelopment. Something a little different and creative. There's opportunity here as well as challenge." City records show McGowan-Walsh has not paid taxes on Cupples 7 for at least five years. Conceivably, the city could seize the building, but Altman doubted officials want the liability. Cupples 7 was condemned to be demolished in 2008, and streets around it have been blocked off since September. The Preservation Board's denial can be appealed to the city's planning commission and then to the courts. Altman had no comment after the meeting about his clients' plans. Saying he has no choice, the owner of a crumbling building in the Cupples Station warehouse complex has applied for a permit to demolish the building. Developer Kevin McGowan, who owns the building at 1014 Spruce St. known as Cupples 7, filed his application on Nov. 9th. Streets around the building have been blocked off since late September due to safety concerns. 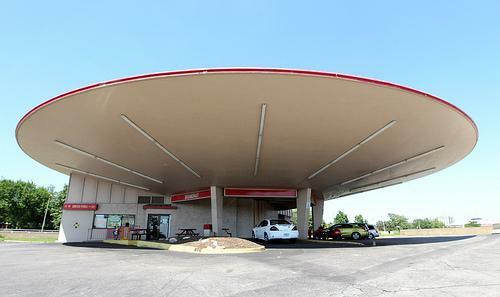 Updated with comments from the city, preservationists. 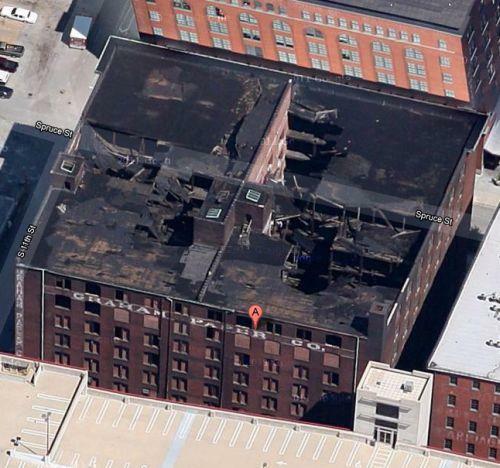 Pedestrian and car traffic will be restricted at Spruce and 11th streets in downtown St. Louis indefinitely because the historic Cupples 7 building has become structurally unsound.